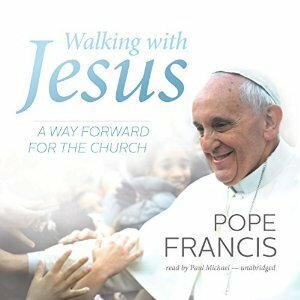 Walking with Jesus: A Way Forward for the Church by Pope Francis. I know that I’ve said this in other reviews, but I love Pope Francis. One of my favorite books last year was The Name of God is Mercy, another main idea in Pope Francis’ teachings. Christianity is about mercy. It’s a beautiful book and I suggest it whether or not you’re a Christian. And this is coming from a non-Christian. One of the main messages of this book is, again, about mercy. How important it is. But, Pope Francis incorporates it into a bigger message about Jesus and his role in the Gospels. The point that struck me most was that most of Jesus’ teachings are done when he’s traveling somewhere. He’s constantly walking and moving. He’s in action, which should translate to Christianity. The Church should always be in motion, changing and adapting. I love that description because it’s true. A community should always be changing to remain an accurate community. Pope Francis’ remarks always give me hope about Catholicism. The image that it comes with really isn’t accurate. It’s full of love and acceptance, even in places where you least expect it. This is another example of how that is.